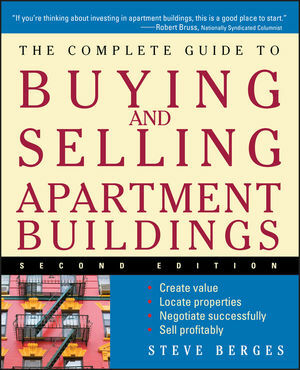 Whether you?re a first-time real estate investor or a seasoned professional, The Complete Guide to Buying and Selling Apartment Buildings helps you map out your future, find apartment buildings at a fair price, finance purchases, and manage your properties. Now revised and expanded, this Second Edition includes tax planning advice, case studies of real acquisitions, and appendixes that add detail to the big picture. Plus, it includes a handy glossary of all the terms investors need to know, helpful sample forms that make paperwork quick and easy, and updated real estate forecasts. With this comprehensive guide at hand you?ll find profits easy to come by. STEVE BERGES is a real estate investment professional with over twenty-five years of experience. As principal of Symphony Homes, he is an active investor specializing in creating value through various real estate mechanisms, including single-family houses, multifamily apartment complexes, and the development and construction of single-family and condominium housing communities. He holds an MBA in finance and marketing from Rice University. His other books include The Complete Guide to Real Estate Finance for Investment Properties and The Complete Guide to Flipping Properties, both from Wiley.